It had been a busy three weeks for Kevin Cheveldayoff. The Winnipeg Jets general manager had transformed himself from a hesitant participant in the trade front, to an active dealer. Granted, the big trade was forced upon him but Chevy finally started to make moves for the present, rather than stick with the tired “draft and develop” formula. With Mathieu Perrault sidelined until April, the Jets were in desperate need of some help up front. 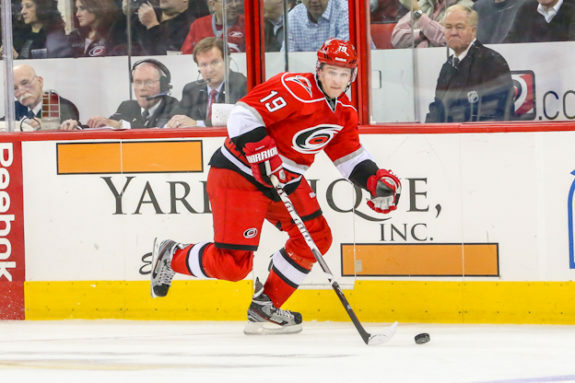 Chevy last week obliged by acquiring Jiri Tlusty from the Carolina Hurricanes in exchange for a third round pick in 2016 and a conditional sixth round pick in 2015. The day before the deadline, the Jets also obtained Lee Stempniak from the New York Rangers in exchange for Carl Klingberg. While neither deal is a blockbuster, it gives the Jets some experience and versatility at forward. Tlusty is very close to both Michael Frolik and Ondrej Pavelec as they played minor hockey together in the Czech Republic. Tlusty can be used on the power play and can be slotted in either the second or third line. In his first two games as a Jet, Tlusty has been on a line with Mark Scheifele and Drew Stafford. Stempniak has bounced around the NHL, with Winnipeg being his seventh NHL city in ten seasons. In 53 games with the Rangers, Stempniak tallied 9 goals and 9 assists. It’s possible that Stempniak could play on the third line with rookie Adam Lowry, but that remains to be seen. The Michael Frolik situation remains problematic. Frolik will become an unrestricted free agent on July 1, and while talks are ongoing, no new deal has been reached. While trading Frolik was an option, Chevy decided not to pull the trigger on a deal. "I did have a conversation with Michael Frolik's agent today. I said 'I'm not trading Michael.'" -Cheveldayoff. The Jets are taking a big risk here. They can’t afford to lose Frolik for nothing over the summer, yet they may not be able to afford to pay Frolik what he wants. Frolik is making $3.3 million this season, while putting up 13 goals and 20 assists in 64 games. With Dustin Byfuglien and Andrew Ladd becoming UFAs at the end of next season as well as Jacob Trouba and Mark Scheifele’s entry deals expiring in 2016, the Jets will have some very difficult decisions to make. There is no turning back now. The Jets must make the playoffs this season. With Chevy making is big move three weeks ago by dealing Evander Kane and Zach Bogosian to Buffalo for Tyler Myers and Drew Stafford, it signalled that the Jets were ready to take the next step. Cheveldayoff was smart in not giving up top prospects like Nikolaj Ehlers and Nic Petan, while receiving veteran help. The fans are craving for playoff hockey in the Manitoba capital. Now it is time for the team to deliver.